Do not this phone number 020 3746 5234! You will need it whether for reservations, or for regular furniture cleaning. Book our comprehensive upholstery and sofa cleaning service. You will not regret! The perfect final outcome is guaranteed! Our sophisticated Bedford Park W12 upholstery and sofa cleaning services are suitable for residential and commercial purpose. Every one of you can benefit from it: property managers, home owners, tenants, office and big corporate buildings. Landlords and real estate agencies get special discounts for our services. It is not a secret why we are so successful. We just love our job and we never leave a place with unfinished job. We approach a customer individually and we accept all furniture types: cotton, synthetic, wool, linen, silk, viscose, organic fibre, chenille, suede, plush, acrylic, nubuck, leather. Hard job, dusty or wasted couches cannot scare us! We can support you get rid of any kind of stains, including paint, blood, tea, coffee, vomit, wine and oily stains. We also have modern formulas for stubborn stains like machine oil, ink or glue stains. Stain pre-treatment is a major part of our modern Bedford Park W12 sofa and upholstery cleaning schedule. We vacuum and sterilize the affected area, dust and disinfect the whole piece of furniture. In addition to these, we apply one of two popular and efficient cleaning techniques with 100% fulfilling final result. Dry upholstery and sofa cleaning technique is suited for fine and 100% natural materials. We use no water or liquid products. The treatment consists of only one contemporary eco-friendly agent that dissolves the filth deeply inside the materials. Our innovative dry solvent technique is applicable on wool, cotton, linen, silk, plush, chenille, nubuck, leather and viscose. 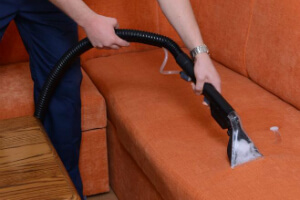 Steam sofa and upholstery cleaning Bedford Park W12 is a more complete sanitizing procedure. It is a hot-water extraction method we employ with our latest machinery. Speaking of which, know that you don’t have to supply us anything for the services. We deliver everything necessary. Steam cleaning is usually recommended for old, synthetic and very dirty items. Our eco-friendly sofa and upholstery cleaning firm uses only organic and natural solutions with no risky impact either on your living space, or on the environment. Meet RA Sofa Clean, the company with more than 10 years of rich experience in the field of luxury, domestic and commercial upholstery and sofa cleaning and with more than 10 thousands of new happy clients per year. We are happy to note that most of our clients come to us upon recommendations by other completely satisfied customers. Every feedback left about our work is important and moves us forwards. 96% of the feedback we receive is positive. It is, of course, thanks to the expert teams of diligent and talented upholstery and sofa cleaners Bedford Park W12 that work for us. They are all insured, well-trained, gifted and educated in what they do. Dry sofa and upholstery cleaning with no water and specially tailored for delicate and natural elements. Don’t waste more time, but make a booking for our top-notched sofa and upholstery cleaning service in Bedford Park W12 immediately! Get a 100% free estimate today! Just contact us on this phone number 020 3746 5234!